Last night at the Capital Slam I met a poet who recently returned from several months in the Philippines and Nicaragua. In both countries he gave numerous poetry workshops. Very cool. 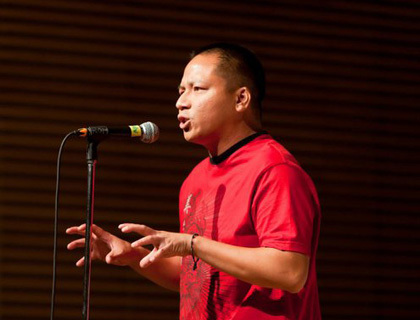 He is a hard-hitting poet whose piece about the selling of girls into sexual slavery in Asia last night was brutally intense. His name is Array of Words. I asked him a lot of questions about his experiences and he told me some very interesting stories. One of them I want to relate here. I asked about technology in the two countries he visited, and how it was being used. He told me that in Manilla he saw street kids in loincloths who had cell phones. And this blew my mind because it is so clearly a digital gift economy. A feedback loop between the material and virtual, between OS1 and OS3. Using mobile phones that let them engage in texted dialogues that transcend time and space – as opposed to relying on the analog technology of talking, which is bound by time and space – these kids can scavenge much more efficiently than they used to. And when they do find food they give it away to each other in their own gift economy. So, the street kids share what they find via text. Whoever finds food tells the others, and they gather. The finder helps out and nurtures mutually beneficial relationships. And the next day someone else finds food and invites the tribe. A full-fledged gift economy, identical to traditional oral hunting and gathering, yet executed using digital tools. Because digital tools are ideally suited to this kind of work: On the fly. Improvised. In the moment. Collaborative. Mobile. Urban. Self-Directed. Empowering. Communal. Those are all OS3 values. All digital values. The Manilla Street Kid Gift Economy has migrated to OS3 without missing a beat, gaining hyper-efficiency and a much greater chance of survival along the way. And who knows what sort of knowledge may come from such systems of survival in time? It matters because it demonstrates how easily a group of contemporary people who are not at all assimilated into OS2 culture (literate culture), but who are in fact members of an urban OS1 (oral) culture, can easily adopt and instantly reap very concrete benefits from OS3 (digital) tools. This is significant because it once again reaffirms the extremely close relationship between oral and digital cultures, and also because it does so by emphasizing just how easy it is for these street kids to make the leap from OS1 to OS3, as opposed to the impossibility of these outcasts ever having access to or learning to use OS2 systems (i.e. go to school, get degrees, find jobs, etc.). Most of these kids don’t even know how to read at all, I’m sure, except maybe a pidgin texting code filled with emoticons and icons, maps and pictures. But these serve them well, allowing them to make social headway without even referencing OS2. In recognition of his work and his excellent stories I’d like to send Array of Words a copy of the ‘gift edition’ of my new book, You Are Your Media. Thanks! Thank you for sharing the story. It has a lot of explanatory power – it has so much sense! Do you think pre-literate kids in general want to gift or take gifts more because of what you describe? They always attempt to set up some gift systems… Adults usually interfere!